BFI Southbank hosts the UK leg of the British Council's global Dickens read-a-thon with a special on-stage reading, and celebrates the continued influence of Dickens 200 years after his birth with a showcase of new films inspired by the man and his work. Dickens in London is an interactive, cross-platform project which brings together artist film-maker Chris Newby and writer Michael Eaton to form a biographical portrait of Dickens’s life via film and the spoken word. Screened exclusively in its entirety at this special birthday event, Dickens in London will also be broadcast Monday 6–Friday 10 February at 10.45am on BBC Radio 4, with the films available online at www.bbc.co.uk/radio4 or at the Red Button. Three new short films from London film-makers and commissioned by Film London will also screen at the event hosted by the BFI’s Dickens on Screen co-curator Adrian Wootton. 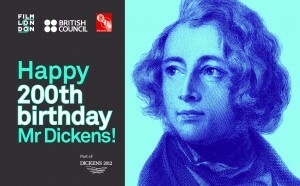 This event is organised by Film London, the British Council and the BFI as part of Dickens 2012. The event is supported by Oliver Twist Gin and Fentimans.